According to National Institute of Standards and Technology(NIST) Cloud computing is a model for enabling convenient, on-demand network access to a shared pool of configurable computing resources (e.g., networks, servers, storage, applications, and services) that can be rapidly provisioned and released with minimal management effort or service provider interaction. In Figure 1, Various applications, Storages, and Infrastructure servers are running over the cloud and accessible for all type devices such as Mobile phone, Computers etc. Cloud can be accessed through internet depend upon permissions. Cloud is useful for external user access. Amazon Web Services, Google Cloud, Dropbox are the few examples of cloud technique. virtualization is a Software which creates “separated” multiple images of the hardware and software on the same machine. This makes possible to install multiple OS, multiple software and multiple applications on the same physical machine. Using the virtualization software can reduce the cost of hardware and it increases utilization, accessibility and efficiency of the infrastructure. Virtualization works on the top the hardware of the physical server and divides its hardware into multiple segments (Virtually only) where virtual machines are then installed. Figure 2, Single Physical Machine divided into multiple virtual machines using Virtualization Software. In Figure2, VMware software has divided/splits the Physical servers into multiple machines and all the virtual machines reside within the same Physical Server itself. It is accessible to all the users (proper credentials) without any restriction. Using cloud for applications is cost-efficient. Least possibility of access failure due to non-dependency on a single machine. Cloud provides you independence from machine access. URL will give you access to your infrastructure all the time. Cloud is reliable for Backup and recovery since data storage is not server specific. Cloud computing is the best platform to showcase your applications/software worldwide. Users can access your application & work on it using a single link. Flexibility to access it from anywhere makes it popular among users and service-providing industries. Server virtualization is the top reason behind its success. IT industries setting up thousands of servers’ machines using virtualization technique. Multiple applications can be installed on single physical machine despite OS dependency. The setup cost is very low. Virtualization can be done on Personal Computer. Desktop virtualization feature provides flexibility to virtualize the whole system by a single click. Virtual infrastructure works well with the low-speed network access. Virtualization has reduced the cost of Hardware in IT industry because the single server can serve as multiple machines. Virtualization is Plug & play service; Thousands of machines can be created and make available for use without taking much time. Virtualization software can virtualize the physical servers without taking much time. 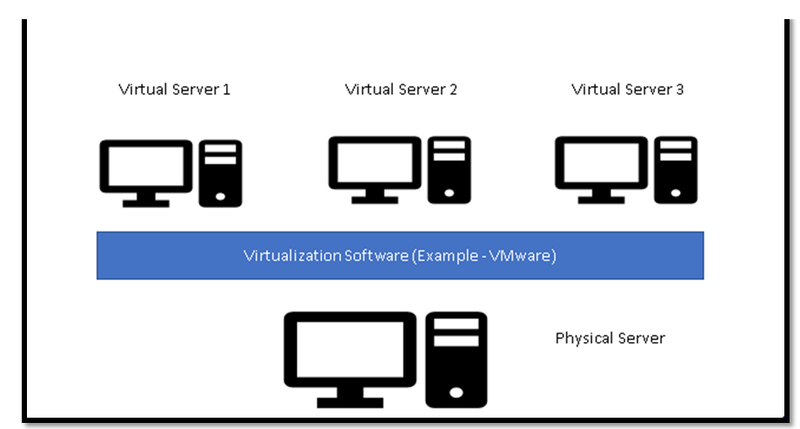 A Virtualization is a software that virtualizes your hardware into multiple machines while Cloud computing is the combination of multiple hardware devices. In Virtualization, a user gets dedicated hardware while in Cloud computing multiple hardware devices provide one login environment for the user. Cloud computing is best to access from outside the office network while Virtualization meant to access from office only. The cloud environment is accessible through URL so can be accessed outside work premises (Depending upon permission). Virtualization doesn’t depend upon cloud computing environment while without virtualization cloud computing can’t exist. The Cloud computing works on IaaS (Infrastructure as a Service) while virtualization is based upon SaaS (Software as a Service). Shared computing resources like software and Hardware provides you cloud computing environment while Virtualization comes into existence after Machine/Hardware manipulation. Cloud Computing provides you flexibility such as pay as you go, self-service etc. while access to virtualized environment won’t allow you to such features. Cloud computing is good for selling your service/software to external users while Virtualization is best for setting up Data Center within the company network/infrastructure. Storage capacity is limitless in the Cloud network while in a Virtualization its depend upon Physical server capacity. Cloud can be extended as much as you want. Virtual machines configuration limits its scalability. Setting up the cloud is a very tedious task. It is very simple to setup virtual environment. It is very flexible for user access. A user can access its cloud from any location with internet (depending upon permission). Proper authentication is required before accessing the virtual machines. Cloud integration allows future expansion of Users, applications etc. Virtualization integration allows expansion of new machines within the same infrastructure. Can be accessed from all over the world. (Internet-based cloud) Proper permissions are required for accessing from outside the network. Not depend upon one machine. Single machine failure can bring done multiple virtual machines. 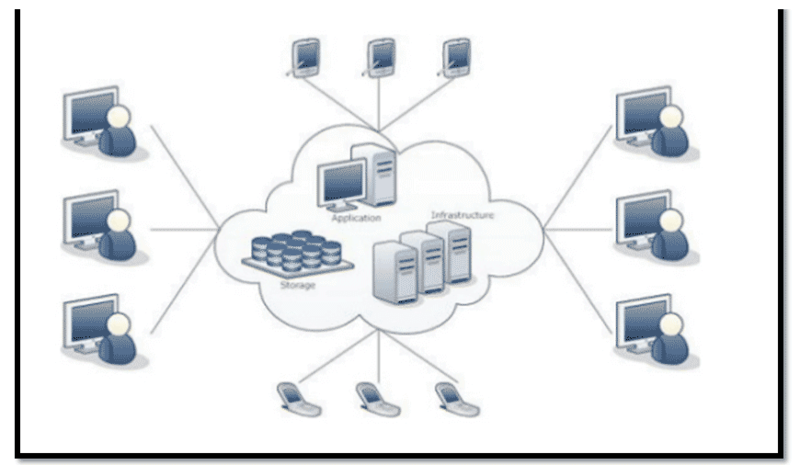 Types Private Cloud and Public Cloud Hardware virtualization and Application virtualization. Cloud Computing and Virtualization both is essential for today’s requirement. Cloud is good for public use another side IT companies use Virtualization for cost-efficient data center setup. Cloud infrastructure cannot be established without the help of virtualization. It is the foundation of cloud networks. In IT infrastructure, cloud computing and virtualization are used together to build a cloud infrastructure. Virtualization separates the hardware from physical machine to create multiple virtual machines on the same server while cloud gets build using multiple virtual infrastructures which combines the multiple virtualize applications/software/servers to create one instance for each application or software or server for users.